Last night my cousin had her first baby. Big deal right? Well to me it sort of got me remembering when she was a baby and how she came to live with us for a week because her mom was really sick or something. I remember I felt like I was her mom and wanted to take care of her and put her to sleep and feed her. I am sure my mother did most of the caring for her, but to my little child mind I felt like I was her mother, even if only for a short time. And when I got thinking about that moment in my life that is so seared in this brain of mine I have to wonder if that wasn't a pivotal moment, when I put aside my dreams of becoming a doctor and realized for the first time what a dream it would be to become a mother. Some days I wonder if I am really cut out for it. I feel like a failure. I have been having anger issues which I am working on, they are really getting much better (mostly because I am feeling much better, finally). I am a lousy teacher, I can't do lesson plans or set aside certain hours of the day to homework and learning. But I find I always have the right words to say when special moments come when the boys are curious about something. I love that my boys are so good at entertaining themselves for most of the day, because I can't handle them all day long most days, but I love those special one on one moments right before bed or in the middle of the day when we snuggle and they tell me about their favorite games and how much we love each other. I am especially good at yelling at James which I hate. I feel so horrible about it and I am always apologizing to the poor little guy, but somehow he always tells me he loves me and how pretty I am and snuggles with me something fierce and I just love that boy of mine. I love how Benji is so smart and can figure out any game, is learning to play the piano and is set to be in the Spanish immersion program for the next few years (I need to hone up my Español). He is such a tender little giant too and I love how sweet he is to everyone. 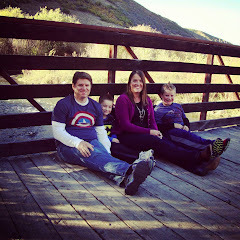 I am so thankful for the opportunity to be a mother to 2 special and uniquely individual little boys. And I am thankful for that moment years ago when for a week I got to be a mother and realize a new dream really my only dream of becoming a mother.